A skier zooms straight toward a big terrain-park booter, launches into the air, rolls a shoulder forward into an off-axis front flip, spinning on a diagonal while grabbing one ski with the opposite hand¿then lands in reverse. He skis backward to the next jump, vaults backward into the air, and¿with a leg and an arm extended straight up and down, the other leg pulled in like a hurdler&apos;s, the ski grabbed underfoot¿spins upright 540 degrees, a helicopter and a half. He lands facing downhill and skis swiftly away. Bystanders cheer. Nearby, skiers pop as high as 10 feet out of a halfpipe, spinning, flipping, grabbing, tweaking, landing sometimes forward and sometimes in reverse. This is weird-looking stuff, so acrobatic and inventive that it&apos;s hard for the untrained eye to untie the knots. But it&apos;s also playful, stylish¿and contagious. Gone, quite suddenly, is the vibe of extreme self-seriousness that characterized skiing&apos;s leading edge for the past 10 or 15 years. On mountains of all shapes and sizes, north to south and coast to coast, music is pumping, skiers are jumping, and strange new shapes are flying through the air. Flash point. February 11, 1998. Lizuna Kogen, Japan. Jonny Moseley, clad in red, white, and blue, vaults into the air, grabs his left ski with his right hand, tweaks his boards neatly into a bold, funky X, and spins like a top in the sunny Nagano sky. Music thumps loudly. The crowd on the sidelines roars. Back home in the USA, 180 million Americans watch the day&apos;s Olympic coverage on TV; couch potatoes who couldn&apos;t care less about competitive freestyle find themselves sitting bolt upright and shouting out, "Yeah!" Moseley sticks his landing like an agile cat then slithers seamlessly through the remaining moguls, bursting across the finish line, breaking into a huge grin, flipping a K2 neatly upright in one hand for the cameras and thrusting his other index finger into the air. "I knew when I landed that jump I had won," he said later. It was, arguably, American freestyle skiing&apos;s most glorious moment. Once renegade, freestyle had fought for acceptance by skiing&apos;s mainstream from its infancy in the mid &apos;60s to its debut as an Olympic medal sport at Albertville, France, in 1992. In the fight for legitimacy, it had matured from groovy, expressionistic hotdogging into a system of judged events, tightly delineated moves, and precisely rendered technique. By the time Moseley stood in the starting gate, freestyle skiing had become, in the minds of many spectators and participants, anything but free. Now things were coming full circle. A California boy with the skills of a champion, the lingo of a surfer, and an irreverent, irrepressible spirit uncorked something fresh and hip¿and captured Olympic gold in the process. In the act, Jonny ignited imaginations and made a jaded and sports-saturated America once again think of skiing as both gleeful and cool. One thing&apos;s for certain: His gold wouldn&apos;t have had the same impact if he&apos;d won throwing a spread-twister-spread. Ironically, Moseley&apos;s beautifully executed 360 mute grab was, by the standards of the leading players in freestyle&apos;s new school, actually quite tame. And though it may have appeared to the television masses that Moseley had invented the maneuver himself, he hadn&apos;t.
Genesis. 1995. Somewhere in Quebec. In 1995 J.P. Auclair was a mogul skier like many others, rising through the ranks of structured freestyle on the Quebec provincial team with his frères J.F. Cusson and Vincent Dorion. Like most young bumpers, the three had their eyes on the World Cup and the Olympics, but they always stood a bit apart. "We would always be goofing off, going to the snow park after training, trying to do new stuff all the time," Auclair says. They were yelled at plenty¿many terrain parks still had signs proclaiming Snowboards Only¿but the heckling was nothing compared with the blast they had pushing thenvelope. They weren&apos;t the only ones pushing it, of course. U.S. Ski Team mogulist Jim Moran had debuted the helicopter iron cross to win a World Cup event at Breckenridge in January 1993, and Andrew Shepard, from Nelson, British Columbia, had grabbed his skis during a jump for the 1994 ski flick Cosmic Winter. "It was the coolest, smoothest thing I&apos;d ever seen," remembers Auclair. He and his fellow Canadian innovators took it from there. Little did they know their test piloting would eventually launch worldwide ski convention into outer space. By the summer of 1996, the group had expanded to include British Columbians Shane Szocs and Mike Douglas, and the New Canadian Air Force was born. Szocs and the three Quebecois were now on the Canadian National Development Team; Mike Douglas was their coach. "I saw J.F. Cusson do a 360 with an iron cross, but instead of just doing the iron cross, he reached down, grabbed, and pulled on his ski," Douglas remembers. "It put him in this tweaked-out position, which was probably the coolest thing I&apos;d ever seen. I know that put a spark in me." Soon the New Canadian Air Force was throwing 720 iron crosses, 720 tuck crosses, mute grabs combined with back flips, and a variety of halfpipe moves. Too young to remember hotdog skiing&apos;s history, they fed their imaginations watching videos of core sports like skateboarding and BMX. Using an action figure to study body positions and trajectories and working on the same water ramps used by freestyle aerialists, the rebels started riffing off the spinning, corkscrewing moves they&apos;d seen in snowboarding and aggressive in-line skating. Suddenly, their goofing was going big¿and had become way more engaging than training for mogul competitions. By the winter of &apos;96¿&apos;97, the Canadian fliers were getting noticed. Mike Douglas stuck the first misty flip on skis. From there, he says, the momentum increased every month. In February, several photographers and filmmakers caught their trick sessions on the Blackcomb Glacier wind lip, a natural terrain feature that allows for mondo air and generally powdery landings. That summer, Cusson became the first to combine a misty flip with a grab. Word spread quickly through the competitive bump world. Below the 49th parallel, a handful of top freestylers began trying similar moves. "We&apos;re the race-car drivers of mogul skiing," said Jim Moran, then training for Nagano. "We&apos;re just trying to push the limits of what&apos;s possible on skis." If freestylers were getting innovative, it could well be that they wanted to get noticed. Though mogul skiing had reached the pinnacle of athletic legitimacy when it became an Olympic medal event, its top athletes¿arguably among the most talented and disciplined in skiing¿went largely unrecognized outside their esoteric, bump-obsessed world. Instead, big-mountain freeskiing was the hot, happening thing, and freeskiers like Shane McConkey and Seth Morrison were scooping up the sponsorship dollars and media exposure. Like the &apos;70s freestylers before them, the formerly-known-as-"extreme" freeskiers had been pooh-poohed as indulgent hacks who couldn&apos;t make it in "real" skiing¿until their wow factor gained critical mass, broke through the defenses of skiing&apos;s status quo, and started selling sunglasses and skis. In &apos;97¿&apos;98, the same thing happened to freestyle&apos;s new wave: It gained critical mass, with several forces converging at once. Vincent Dorion began landing and taking off backward (a.k.a. fakie or switch), and the rest of the Air Force quickly followed suit. While switching things up worked well on the hardpack of the East, it was another story entirely in the West&apos;s powder, corn, and crud. With the right boards, the high fliers would be able to do even more. In the fall of 1997, Salomon made a deal with Mike Douglas and the Air Force, and in February 1998, the boys had their first custom-designed prototype Teneighty, a twin-tip ski with considerable sidecut. It worked everywhere they wanted to go¿park, powder, bumps, hardpack¿and enabled them to ski switch in all kinds of snow. 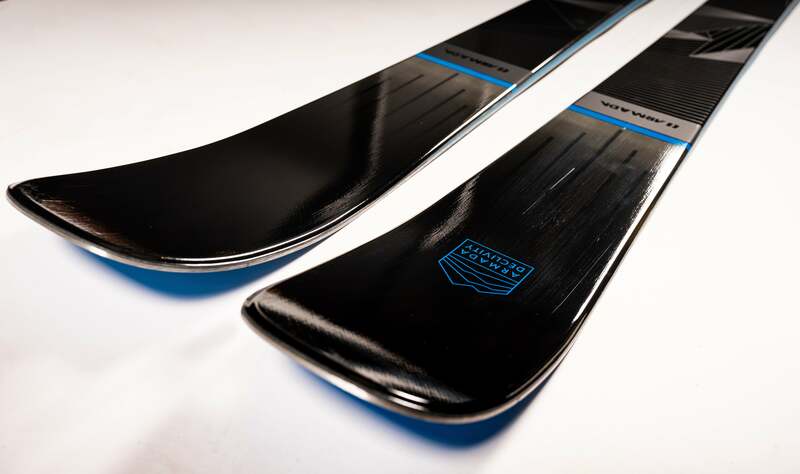 At the same time, the ski industry was realizing it needed to make a big play for the under-20 market if it hoped to still be selling ski products to adults with disposable income in 20 years. Aggressive splinter sports like street luge were getting big coverage on TV. Why not the sport that started the whole extreme scene? Moseley&apos;s Nagano win, the Canadians&apos; partnership with Salomon, and the great North American love affair with terrain parks (in 1998, roughly 200 U.S. ski areas had sculpted terrain features) converged like a big bang. At Vail in February 1998, Freeze Magazine put together the first U.S. Freeskiing Open, a new style of competition designed to showcase skiing&apos;s new moves. Auclair won the big-air event and Cusson won the slopestyle. Before the end of the season, similar events were held in Japan and Sweden, and in June 1998, a half dozen of the best new tricksters were invited to perform on an enormous ramp built high above the throng gathered for San Diego&apos;s Summer X Games. "The X Games took us out of the closet," Douglas says. By the beginning of the &apos;98¿&apos;99 season, new school events seemed to be cropping up every week. What no one expected was how old-school bumping, new school freestyle, and big-mountain freeriding would roll together into one big snowball of fun. Fusion. January 28, 1999. Snowbird, Utah. Snowbird&apos;s East Baldy is an 1,800-vertical-foot expanse of steeps, rock clusters, and cliff bands. On the final day of the U.S. Freeskiing Nationals, several hundred spectators basking in the sun at its base watch in awe as the leading male competitors integrate the finest elements of big-mountain flow with the big air of terrain-park slopestyle. Sebastian Michaud, a former World Cup freestyler from France, flashes top to bottom in the blink of an eye. His descent includes three big hucks, most notably an enormous back flip off a rock-encrusted nose. He wraps up his heart-stopping run with a long, warp-speed straight-line shot through a pencil-thin chute, over a cliff, into a bone-crushing compression, and out to the finish. Big-mountain freeskiing (once known as extreme skiing) has come a long way since its inception in the early &apos;90s. Competitors have formed a sanctioning body called the International Freeskiers Association (IFSA). Events are judged according to standardized rules and criteria. Prize purses have quadrupled. And with ex¿World Cup competitors from both racing and freestyle jumping into the game, the level of competition keeps getting more intense. At the Nationals, Michaud is far from the only competitor weaving front flips, back flips, helicopters, grabs, and other air tricks into technical descents. Kristen Ulmer, one of the event&apos;s judges, says, "It&apos;s the sickest thing I&apos;ve ever seen in my life." Later that week, IFSA sanctions the Red Bull Freeride, also at Snowbird. Snowboarders and skiers compete in separate classes on the same venue. The course starts like a geländesprung, with a straight shot down a steep ramp into a big kicker. Competitors go as big as possible, throw their styliest tricks, then continue downhill to a quarterpipe, where they get bonus points for hang time. Total prize package: $10,000. "The skiers were going bigger and throwing tricks that were way more rad," says one event official (who wishes to remain unnamed). "They can split their legs and get creative. All snowboarders can do is flop that big board around." IFSA&apos;s involvement in both events is no accident. The organization was initially formed to protect and foster athlete interests in freeskiing events like Crested Butte&apos;s annual U.S. Extreme Freeskiing Championship and the World Extremes in Valdez. "We now sanction any freeskiing event that is judged," says IFSA vice president Lhotse Merriam, "which includes big-mourable sidecut. It worked everywhere they wanted to go¿park, powder, bumps, hardpack¿and enabled them to ski switch in all kinds of snow. IFSA&apos;s involvement in both events is no accident. The organization was initially formed to protect and foster athlete interests in freeskiing events like Crested Butte&apos;s annual U.S. Extreme Freeskiing Championship and the World Extremes in Valdez. "We now sanction any freeskiing event that is judged," says IFSA vice president Lhotse Merriam, "which includes big-mountain freeskiing, slopestyle, big air, halfpipe, and quarterpipe." The movement, explains Merriam, comes from the skiers themselves, who say they want ongoing input into the structure of their events. With the IFSA&apos;s help, competitors are shielded from the whims of event organizers and the meddling of TV crews or sponsors, leaving them free to both innovate and enjoy. "Skiers want to control their own sport and not get lost in the corporate shuffle," Merriam says. But IFSA&apos;s involvement walks a fine line. At its essence, skiing is all about the sensation of freedom. Whenever the sport gets too constricted by rules and regimen, a few rebels come along with a new way to recreate that freedom. Wayne Wong, John Clendenin, and the rest of the original hotdoggers did it in the 1970s. Scot Schmidt, Glen Plake and their extreme friends did it in the 1980s. Douglas, Moseley, and the other new freestylers are freedom&apos;s heirs. But the corollary to the tendency to seek freedom is the tendency to keep score. And in the score-keeping process, the sport&apos;s new liberties tend to become tamed and assimilated until they&apos;re just another part of the status quo. In skiing, the gatekeeper of the status quo is FIS (Fédération Internationale de Ski), the governing body of the World Cup. Lately, the FIS has taken an interest in the new freestyle. At a meeting in May 1999, FIS officials expressed interest in pulling some of the newer kinds of events¿the ones currently sanctioned by IFSA¿"into the Freestyle family." One Canadian official said the main issue would be to establish ownership as early as possible. Another official opined that capitalizing on the new events&apos; growing popularity would help attract interest to¿rather than away from¿traditional freestyle. USSA freestyle head coach Wayne Hilterbrand said he thought that much of what was proposed could be integrated into the existing freestyle format by relaxing some of its rigid rules to allow for greater innovation. Hilterbrand&apos;s suggestion had a history behind it. Canadian mogulist John Smart was a longtime athlete delegate to FIS, where he lobbied for more than three years to have quadruple moves and grabs be recognized in the official FIS scoring. The eventual rule change is what allowed Moseley to throw his photogenic move at Nagano. "You have an infrastructure of politics and bureaucracy behind the sport of mogul skiing that has really held it back," says Smart. "Now new school is taking off in such a big way that the powers behind FIS freestyle are wondering if they made a mistake." Outbreak. July 25, 1999. Horstman Glacier halfpipe, Blackcomb, B.C. A few short years ago, this wedge of year-round snow at 7,000 feet was, in summertime, the exclusive province of seriously aspiring racers and bumpers who worked on subtleties of technique for lap after lap in 22 side-by-side lanes. Now the hits and pipes are the hot zone, and the glacier has become a place where new schoolers, racers, bumpers, amateurs, pros, trendsetters, Olympians, and hacks all come together and groove. Every year the energy builds to a wild, memorable culmination. Today is that day, and the spontaneous one-upmanship in the halfpipe is heating up, with skiers from France and the U.S. joining the New Canadian Air Force. American Shannon Schad is trying to see how big big is; think 15 feet off the pipe&apos;s lip does the trick? Cusson is sticking back-flip liu kangs. The day is not without casualties; Breckenridge freestyler Dan "The Man" Elliot goes up high, comes down hard, and breaks his leg. On the big-air kicker, Auclair&apos;s newest move is something called a barani¿a gymnastics-inspired front flip half twist with an added tweak. In the quarterpipe, Auclair&apos;s latest is something so new it remains (as of this printing) nameless¿and so convoluted that he himself has trouble explaining it: "I go into a back flip and twist 90 degree, then come around and give you a flair, twist the other 90 degree back the other way, then land right." Huh? Auclair&apos;s obsession with movement has paid off again. He&apos;s originated yet another maneuver that is utterly unique and looks incredibly cool. What Auclair does may not be within reach for most of us, but even the trendsetters say that&apos;s not the point. "New freestyle is about utilizing the terrain that you have," says Shane Szocs. "It&apos;s about trying anything you can try on skis, whether it&apos;s landing backward, forward, flipping, not flipping, grabbing, not grabbing. Basically, anything goes." In part, what new freestyle offers that big-mountain freeskiing doesn&apos;t is easy access. Even the smallest 400-vertical-foot ski area in Pennsylvania can have a terrain park. The effect is democratizing, and the spirit is contagious. "We saw kids this summer from Wisconsin or Ontario or wherever throw moves that none of us had ever seen," says Douglas. "We&apos;re seeing 30-somethings that are out there trying to learn a basic grab or a 360 or how to go backward on skis. Even my 60-year-old landlord borrowed a pair of Teneighties from me just to see what this thing was all about, and now he won&apos;t give them back." ¿Check out Freestyle Evolution, a timeline detailing the evolution of freeskiing, in the related links box at the top of the page.in freeskiing, slopestyle, big air, halfpipe, and quarterpipe." The movement, explains Merriam, comes from the skiers themselves, who say they want ongoing input into the structure of their events. With the IFSA&apos;s help, competitors are shielded from the whims of event organizers and the meddling of TV crews or sponsors, leaving them free to both innovate and enjoy. "Skiers want to control their own sport and not get lost in the corporate shuffle," Merriam says. ¿Check out Freestyle Evolution, a timeline detailing the evolution of freeskiing, in the related links box at the top of the page.ou a flair, twist the other 90 degree back the other way, then land right." Huh? Auclair&apos;s obsession with movement has paid off again. He&apos;s originated yet another maneuver that is utterly unique and looks incredibly cool. ¿Check out Freestyle Evolution, a timeline detailing the evolution of freeskiing, in the related links box at the top of the page.